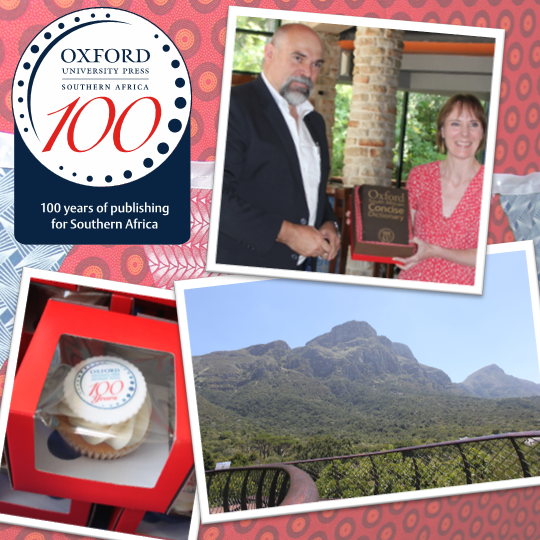 This year marks the centenary of Oxford University Press Southern Africa and its publishing legacy in South Africa. To celebrate this milestone a staff event was held at the world renowned Kirstenbosch National Botanical Gardens. The gardens showcase five of South Africa’s six biomes and are one of the first botanical gardens in the world to be established with an ethos of preserving local flora and fauna for future conservation. Kirstenbosch was an inspired choice: apart from its breathtaking beauty it celebrated its centenary in 2013. In honour of the occasion, and the 100-year commitment of Kirstenbosch and OUPSA to education, Oxford University Press Southern Africa’s managing director Steve Cilliers presented Kirstenbosch events manager, Sarah Struys, with a special leather-bound copy of the Oxford South African Concise Dictionary 2e. The dictionary’s wealth of botanical terms, from African olives to tiger’s jaw, made it particularly relevant. In a speech exploring Oxford University Press’s history in South Africa Mr Cilliers recalled Michael Crichton’s remark, “If you don’t know history, then you don’t know anything. You are a leaf that doesn’t know it is part of a tree.” The reciprocal journeys and goals between Kirstenbosch and Oxford University Press Southern Africa became a running theme across the day. Mr Cilliers noted how the garden’s newly-constructed Centenary Tree Canopy Walkway (or the Boomslang as it is popularly known as) is, quite literally, designed as a bridge toward learning. The structure is designed to take the curious above what they would normally see and find new perspectives on the world around them. If the passion and vigor of Friday’s celebration is any indication of what the next 100 years have in store then Oxford University Press Southern Africa’s future shall be very bright and fruitful indeed.